Le Tyrol sous le nom duq'uel l'on comprend le Comte de Tyrol, les Comtes annexes de Bregentz, Feldkirck, Monfort, Pludentz, etc., et les Eveches de Trente, et de Brixen, sous la protection des Comtes de Tyrol. 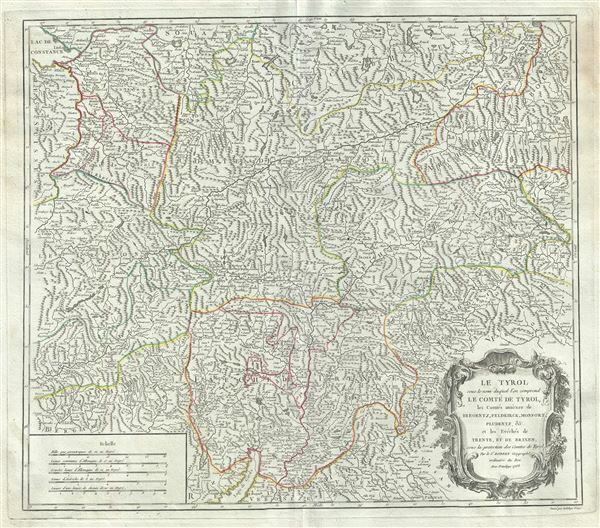 This is a scarce 1753 map of the county of Tyrol in modern day Italy and Austria, by Robert de Vaugondy. It covers this historic region from Lake Constance east to Lienz, Austria and south as far as Lake Garda in Italy. It includes the modern day countries of Austria, Italy and Liechtenstein. The entire region is depicted in extraordinary detailed, offering both topographical and political information, with forests and mountains beautifully rendered in profile. Rumsey 3353.068. Pedley, Mary Sponberg Belle et Utile: The Work of the Robert de Vaugondy Family of Mapmakers, 280.